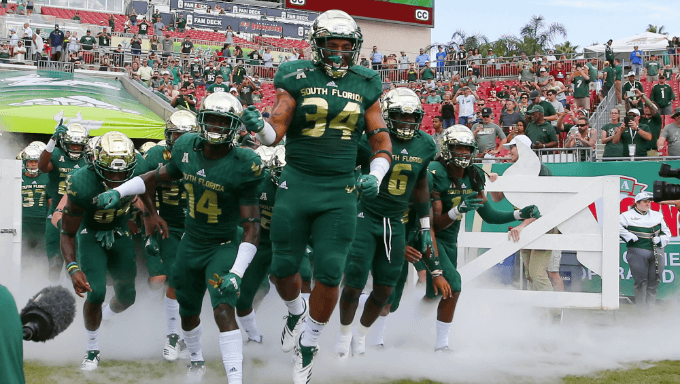 Bet USF to cover -10 at 10/11 with Ladbrokes. Bet Maryland to cover -15.5 at 10/11 with Ladbrokes. Bet Miami (FL) to cover -10 at 10/11 with Ladbrokes. Bet Houston @ Texas Tech Over 71 at 10/11 with Ladbrokes. Bet Boise State @ Oklahoma State Over 63.5 at 22/25 with 888sport. Bet Fresno State Outright at 10/11 with Karamba. Week 3 approaches and college football is starting to settle a little bit. Bookmakers are going to have a better read on the teams now, but there's still a few soft lines out there. Sure, it's going to get a bit tougher week by week now, but there will always be a few interesting lines. What lines look suspect this week? The Bulls seem to really have something in QB Blake Barrett. The junior transfer already has 500 yards through the air, and has accounted for 48 points through the air and on the ground. His lone mistake on the year was a right duck to Georgia Tech early last week. Barrett then went shot for shot with the Jackets before leading the game winning drive and salting the game away with an insurance TD run. While the Bulls have had a lot of trouble defending the run this year, Illinois has only rushing threats left and a poor passing defense. It’s unfortunate for the Illini that most of those issues are injury related with two top WRs out or the season (pour one out for Mike Dudek, the most unlucky player in the NCAA). While Illinois can counter with RB Mike Epstein, he alone won’t be enough to outgun this high powered USF attack. These two teams met last year, and USF blasted Illinois 47-23 with a dysfunctional offense. This year, the offense is clicking and the Illini have less weapons available. One more weird advantage: this game is being played at Soldier Field in Chicago. It’s technically an Illinois home game, but it’s being played in an NFL stadium, a rare treat for Illinois. Meanwhile, USF’s home field is Raymond James Stadium in Tampa, so it’s just another Saturday for the Bulls. Look for the Bulls to cover with ease, Ladbrokes is offering South Florida at 10/11. Maryland has been impressive to start the season, and Temple has been absolutely atrocious. Temple has lost two straight to Villanova and Buffalo, allowing Nova to come back in the 4th quarter and trailing Buffalo for most of the second half. Meanwhile, Maryland soundly proved that Texas is NOT back, before dismantling Bowling Green. The Terps have rolled up 486 yards per game, and Temple is allowing more than 400 a game. Meanwhile, Temple is earning over 100 yards less per game by themselves and just can’t get any consistency on offense. Take Maryland to cover the 16 point line for 10/11 on Ladbrokes. First, somehow Toledo managed to schedule Miami to a home-and-home. Moving on. Miami got hammered by LSU week 1 on national television. It happens. The Hurricanes turned around and annihilated Savannah State 77-0. Malik Rosier hasn’t been great for Miami, nor was backup N’Kosi Perry, but they had 5 touchdown tosses between them vs Savannah. Also the Miami defense was mindbogglingly good. They allowed 48 yards. Turn around, Toledo got 603 yards in their first game, but only against Virginia Military Institute. The two games that Miami and Toledo played last week were similar to each other, but the two teams aren’t the same as each other. Miami’s defense is not VMI’s defense, and Toledo is likely about to run into a brick wall. This might not be a blowout, but Miami has some hype for a reason. Toledo might be exciting offensively, but this Miami team is going to be mad about that loss to LSU still. Take the Hurricanes to cover at Ladbrokes for 10/11. Two extremely high powered offenses are going to result in all the points. Texas Tech is known for the prolific air raid offense, while Houston is developing a lethal passing attack of it’s own. I’m not sure anyone expected Houston QB D’Eriq King to be as prolific as he is this season, but he’s over 500 yards through the air and 7 touchdowns. More impressively, King did that vs Rice and Arizona. More impressively still is how Houston has scored 45 points in both games played. Texas Tech isn’t exactly known for their defense, and they’ve allowed 364 yards per game so far this season, Houston allows 485 per game. There will be points, so take the over for 10/11 on Ladbrokes. Same as above with find and replace a few times. 888sport has the over at 22/25. This really wouldn’t be an upset, but the game is so close that some bookmakers have Fresno as favorites. It’s less a statement of Fresno as a program and more where UCLA is. The Bruins are a mess, Chip Kelly’s first year is a disaster so far, but former head coach Jim L. Mora left him with just about nothing and it showed in the UCLA loss to Cincinnati. Fresno is 1-1 on the year, thrashing Idaho and dropping a close one to Minnesota. However, this Minnesota team might make some noise, and UCLA already showed they couldn’t beat a mid-tier American Athletic team. The Fresno passing attack should do the job, so take Fresno to win outright. You can find Karamba offering Fresno State at 10/11. Hawaii’s attack was about as good as promised last week, but their defense didn’t quite make scratch. Meanwhile Army is rushing for 308 yards a game because the triple option is fun. Most bookmakers make Army a touchdown favorite, but we would suggest staying away from this one. Hawaii’s rushing defense hasn’t really been tested yet, so Army could meet a stone wall or swiss cheese. All kinds of unpredictable, but this game should make a fun watch. This is kind of cheating on the avoid, but with Hurricane Florence barreling toward the east coast, it’s extremely likely these games won’t be played. Anything you can donate to the preparation and recovery efforts would go a long way.